Andrea Abay Abay is an IHDS Certified Living Your Design Guide. As a 3/5 Energy Projector with Emotional Authority on the Cross of Contagion, she enjoys sharing her discoveries and feelings as a creative role model in her Human Design Experiment. Her social media outlets on Facebook, Twitter, YouTube, Pinterest and Instagram help her connect with others around the world who are learning what it means to Live Your Design. Basic Human Design Concepts: What is the ‘Not-Self’? Projectors – Are you ready for the ride of your life? Andrea is also a Professional Analyst Student at Human Design America. Feel free to request Human Design Coaching or just email to inquire about Human Design Mentoring. I agree to represent with professionalism and integrity the Human Design System. I agree to maintain my educational standard by annually participating in official Continuing Education, which includes official courses, workshops, self-study, recordings, and books. I agree to offer only services that I am qualified to offer. I agree in my professional work to use, offer or recommend only officially recognized Human Design System materials and products. I agree that in representing my Human Design services to the public that that is what my clients will receive. 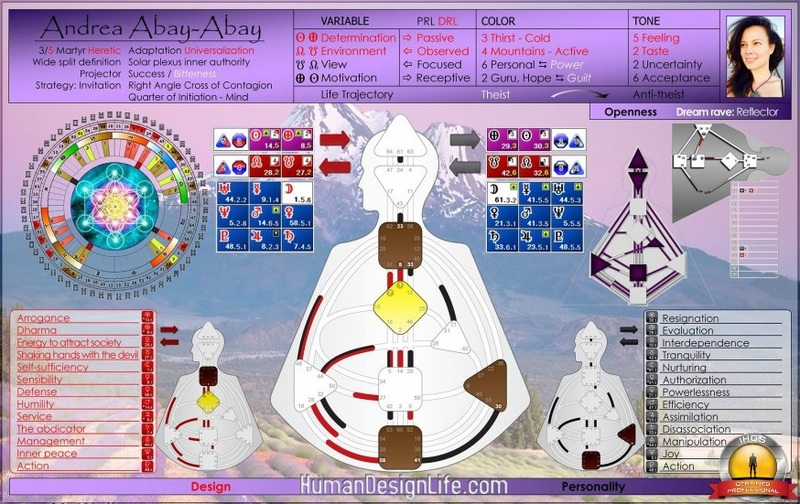 I choose to specialize in the Human Design System as received and synthesized by Ra Uru Hu. I am associated professionally with Jovian Archive Media, Inc., the International Human Design School (IHDS) and Human Design Amaerica, organizations entrusted to preserve the original knowledge and trainings taught by Ra Uru Hu. Ra founded the Human Design System; he received the information directly, synthesized, structured and taught it for 25 years. Ra spoke about how knowledge can be diluted and distorted as it grows and moves further and further away from the original source. It was for this reason that he established Jovian Archive to be the keeper of his original material and the IHDS to establish and maintain an education program worthy of this amazing body of knowledge. Maintaining the original knowledge, teaching and education structure is the mandate of Jovian, IHDS, licensed National Organizations and certified IHDS Professionals. Jovianarchive.com and IHDSchool.com list all approved Human Design organizations and the IHDS lists all certified Human Design professionals. Thank you for your interest in the Human Design System original teachings and knowledge. It is my honor and privilege to share what I know of the Human Design System with you when recognized and invited. This is Cristina from Spain, I’m a 4/6 emotional projector. I learned about human design some months ago, I was really captured on these two words and the most I was exploring into what HD was, the most revealing for me it was. I felt finally recognized through this! I had my reading with Alokanand last February and from then on I made an inner commitment to let me help by HD in order to come back to me. I’m 38 now and I’m going currently through a critical period in my life. I’ve got some healthy deseases and getting outbreaks of recurrent disorders I’ve always had. I would say, I’m in the highest point of burnout, a real mess. To start with, I’m exploring with my emotional authority and strategy, this is helping me for the moment at least, to see my noself, my programmed inertias. Seeing that is a lot for me! I want to take care of me and feel that my relevant pending task is about nutrition. I want to explore on how and what, not only with food, but specially. I’ve followed you through FB and watched alll the videos you upload in youtube and appreciate so much your enthusiasm and way to recognize the others.. it’s inspiring and helpful for me. Andrea I wanted to ask you for advice. How does it work to have some tips from you? Can I ask you for a HPS reading? Is there a basic guideline to start with? an orientation of fees? Thank you for your appreciated feedback.